First Canadian woman elected to the American Ornithologist's Union, an amateur contributing greatly to bird studies from Northern Ontario. She became interested in birding from her log home on Pimisi Bay near North Bay, after retiring in 1935 as a nurse - formerly to the Dionne Quintuplets. She quickly became internationally known as a writer and ornithologist. 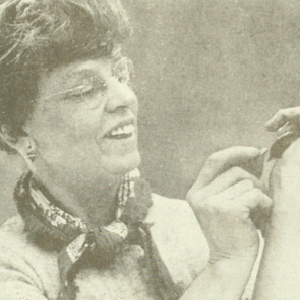 During her life, she banded and recorded over 25,000 birds; she wrote over 500 reviews, 17 scientific papers and 5 books on birds and animals. 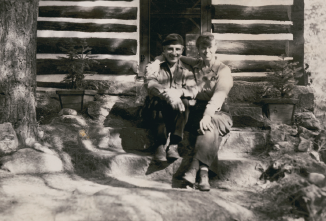 With her husband Len Lawrence at her log cabin. Her dedication and passion for nature writing and research led to such accolades as the John Burroughs Memorial Medal ( 1969) for her book The Lovely and the Wild; the Canadian Authors Association's Sir G. D. Roberts Special Award (1969}; an honorary doctorate, LLD from Laurentian University, Sudbury (1971 }; the Frances H. Kortright Outdoor Writing Award (1980}; and the Doris Huestis Speirs Award from the Society of Canadian Ornithologists. There is also a scholarship named after her at Laurentian University as well as a writers' award created by the Ontario Library Service - North. 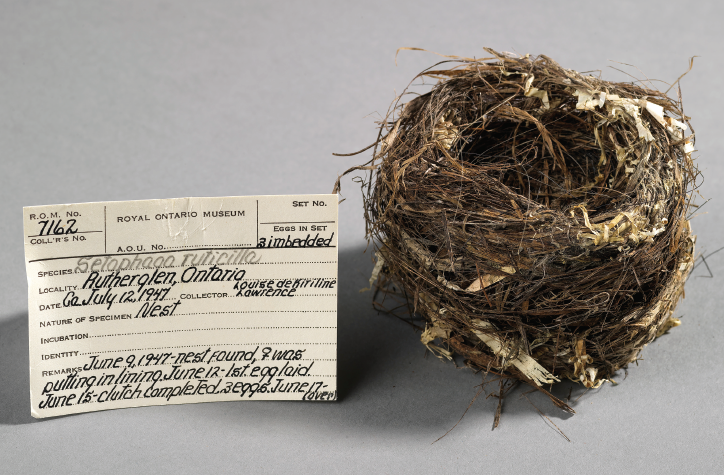 "[It's in] our willingness to read the signatures of nature and our readiness to live with eyes and ears open ..."
Nest of an American Redstart warbler, collected by de Kiriline Lawrence June 9, 1947, in the collection of the Royal Ontario Museum. 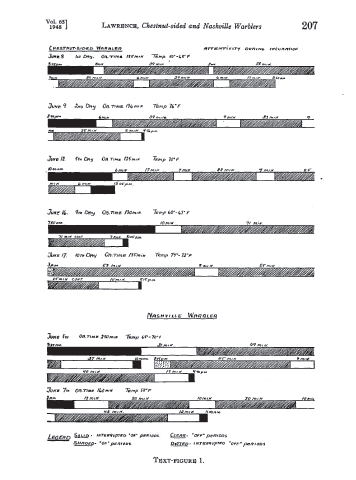 Diagram of nesting behaviour, hand-drawn by de Kiriline Lawrence, from one of her many scholarly articles in scientific journals.